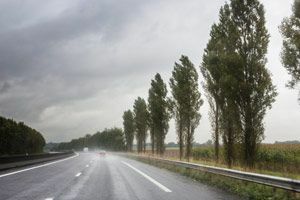 Driving might be a dream on a warm, mild spring day – but when the storm clouds roll in and the winter freeze comes along, getting around doesn’t seem so enjoyable. Nearly 25% of crashes in Illinois in 2011 occurred during wet, icy or snowy conditions, according to the Illinois Department of Transportation (IL DOT). In Missouri, this percentage was just under 24%, according to data from the state’s Department of Public Safety (MO DPS). Weather doesn’t necessarily have to be severe to make our roads dangerous. More than 1,500,000 weather-related car accidents happen in the U.S. each year, based on data from the U.S. Department of Transportation (USDOT). Although bad weather can create dangerous driving conditions, in many cases it is no excuse to stay off the road, despite the potential for auto accidents. If you have been injured or lost a loved one in a car crash during bad weather conditions, you may be eligible for compensation. At Tapella & Eberspacher, we have a reputation for litigating complex cases, such as weather related car accidents. We work with experts in accident reconstruction and financial analysis in order to build a powerful case on your behalf. Find out how we can fight for your justice. Fill out our FREE Case Evaluation form to the right to get started. Illinois and Missouri have somewhat steady weather patterns, with rain, snow and thunderstorms. While these may seem like mild weather events, mild doesn’t mean that accidents can’t happen. A simple sun-shower can lead to hydroplaning, which can cause shocking collisions. If there are weather alerts in the area, it is wise to stay off the roads. Although our location is not really prone to natural disasters, extreme weather events have been known to happen – five hurricanes have passed through the Illinois-Missouri area in the last 100 years! When weather emergencies happen, follow any instructions and evacuation procedures provided by your local municipality. While heat is unlikely to cause an accident, it can cause tragedy. In the summer months, it is important to remember that intense heat can be deadly when a child or pet is left in a vehicle. Make sure to check twice for all of your passengers! According to the Fatality Analysis Reporting System (FARS), over 2,300 fatal U.S. car crashes in 2011 occurred during rain and more than 650 while snow or sleet was falling. Although rain and snow may not seem like serious conditions, the truth is that the road is affected by such precipitation – and your driving habits should be, too. These types of bad weather can not only affect the road, but impact the flow of traffic and a driver’s operating abilities. Even the most skilled driver cannot deny the dangers of bad weather – especially on frequently traveled roads. It is essential to keep your eye on other vehicles in order to avoid an accident in bad weather. Both humans and cars have evolved tremendously – but despite the continuing revolution of auto safety, we still can’t change the weather. In bad weather, even the most cautious driver can’t always avoid an accident. If you’ve been injured because of a weather-related auto accident that was due to another party’s negligence, you deserve justice. The auto accident attorneys at Tapella & Eberspacher have a superior reputation for quality, personal service. Our results are the foundation of our premier status, and if we take your case, there are no attorney fees unless you receive compensation. Call us. We can help you make sense of your legal options – for free. Dial (855)522-5291 today. You can also get started online – just fill out our FREE Case Evaluation form at the top of this page.